Markus Kramer said it so nonchalantly when I asked him. “Three months ago,” he said. I couldn’t believe what I was hearing, so I asked in a different way. “You mean to tell me this motorcycle didn’t exist four months ago?” Again, the response was simple. “Yep.” Markus isn’t a man of many words, but that’s when I knew this ride aboard the GP2 Prototype from Kramer Motorcycles was going to be different. I shouldn’t have been surprised. Back when KTM’s 790 Duke was first announced, I knocked on Joe Karvonen’s social media door, asking the sole importer for Kramer Motorcycles USA whether the 790 Twin engine would make its way into a Kramer. If you pester the right people enough, sometimes you get to ride really cool motorcycles like the Kramer Motorcycles GP2 Prototype. The fact this plan was even happening at all is what I love about small companies, and they don’t get any smaller than Kramer Motorcycles. With only three full-time employees – Markus Kramer, his wife, and assistant Matthias Bock – Kramer Motorcycles doesn’t have the luxury of huge test teams like the big boys do. This is only a little bit alarming considering Kramer builds race-only motorcycles (don’t worry, he does have one test rider, former KTM European Junior Cup competitor Lukas Wimmer), but having ridden the company’s first offering, the excellent HKS EVO2, powered by KTM’s 690 Duke Single, I knew I was in good hands. You see, in this job, us journo types don’t generally see motorcycles that are still in their infancy. When a big manufacturer like Honda hands us the keys to their motorcycles, a team of test riders and engineers have developed a few iterations of the machine in private, far away from the public’s eye. By the time the media or the general public throw a leg over a motorcycle, it’s the finished product. All the T’s have been crossed, the i’s are dotted, and (hopefully) the bolts are tight. Twenty-four hours prior to this photo Joe Karvonen finished putting this motorcycle together. Here, he’s sweating bullets hoping he didn’t forget anything. Not that a big-buck effort was what we wanted anyway. Here we were, a small group comprised around a journalist hack, on the ground level of a new motorcycle’s development. My input would actually have some sort of meaning (or at least I hoped it would). Unlike the usual rides I get invited on, this motorcycle was far from finished. In fact, it was just beginning. This was going to be fun. It’s difficult to see in a photo, but the frame spars near the frame slider had to be cut and welded to accommodate the extra cylinder of the 790 Duke compared to the 690. Another interesting bit: the standard KTM 790 has small air channels to help feed the rear-facing airbox. The GP2 doesn’t have those channels, or even a hint of ram-air. Our 100 hp rear wheel guess was definitely on the optimistic side. Because the GP2 was so new and Markus Kramer only had three months to put a bike together before Barber, there were many unknowns. Firstly, instead of designing an all-new frame for the bike, the 790 Twin sat inside a modified frame of Kramer’s first model, the EVO2, which was originally designed for KTM’s 690 Single. Frame spars were “massaged” (ok, they were cut and welded) to fit the extra cylinder. A wider swingarm was also fitted to accept a 180-series rear tire compared to the 160-series rubber more commonly used on the EVO2. 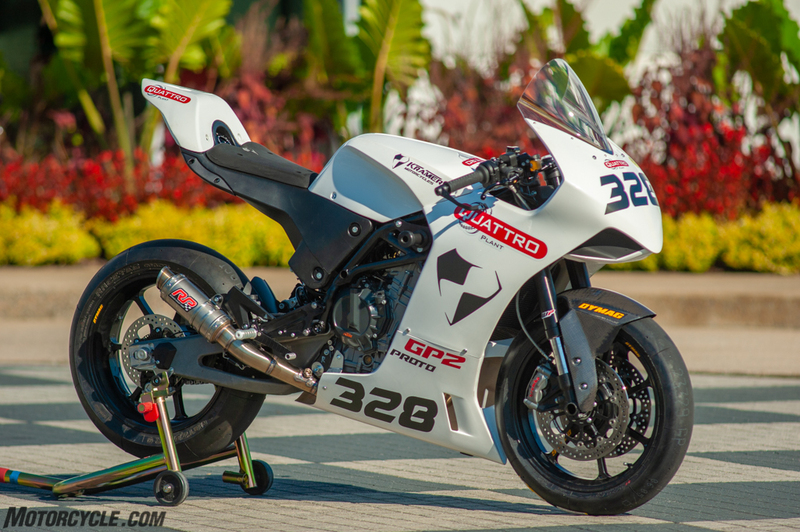 Due to a lack of development time, the stock KTM electronics, ECU, and software were kept on the GP2 in order to get it out the German door and shipped to Alabama in time. Various sensors to optimize the 790 Duke’s rider aids – like wheel speed sensors and such – didn’t make the cut because of the time crunch, so only necessary electronics to make the engine run were kept. This meant the OEM quickshifter and traction control weren’t functional. The only performance add-on was an exhaust system. It made the GP2 one of the best sounding bikes in the whole paddock, but the fuel mapping wasn’t altered one bit for the exhaust – for all we knew we might have actually hurt our performance! Our best guess was about 100 hp to the wheel, similar to what the 790 Duke puts down. 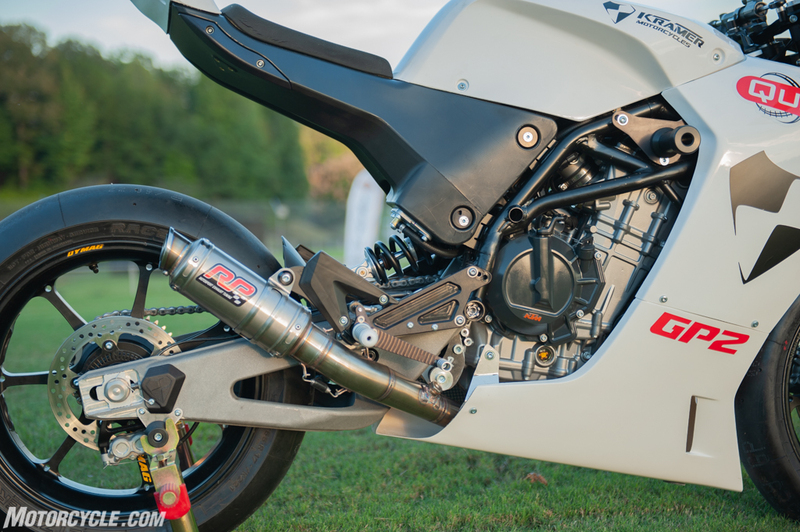 Sportbike designers are always finding ways to optimize efficiency and have components serve multiple purposes. Kramer has done exactly this with its XPE Plastic composite fuel tank/tail, produced by Slovenian company Roto Industries. Acting as the fuel tank, tail section, and seat, the 3.17-gallon tank has to be seen in person to fully appreciate. See also the Dymag forged wheels and twin 290mm discs squeezed by Brembo M50 calipers. Otherwise, from a component standpoint, the GP2 Prototype is hard to distinguish from its EVO2 cousin. It still uses WP suspension, forged wheels from Dymag, and dual 290mm discs with Brembo M50 calipers. Even the bodywork was the same (which won’t be the case on the final production model). To me, the coolest single feature of Kramer Motorcycles is the composite fuel tank manufactured by Slovenian company Roto, that also serves as the tail section, subframe, and rider seat. It’s a simple yet elegant, efficient, and effective design. 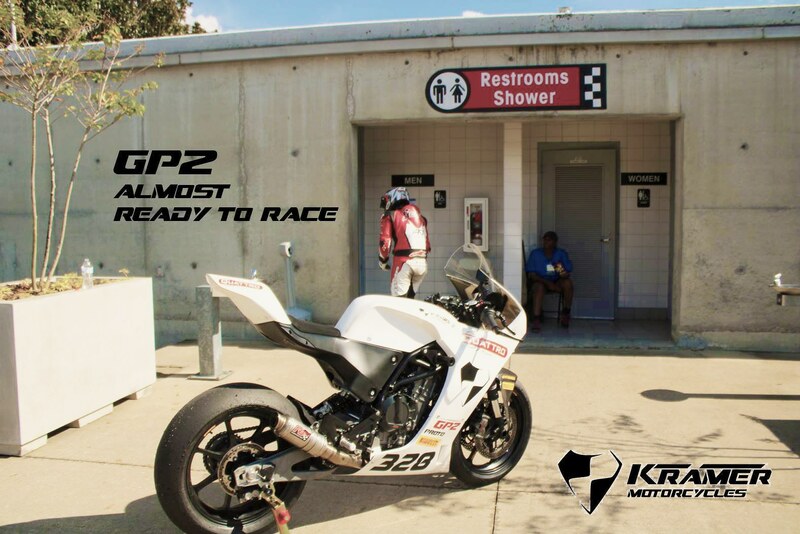 Being uncharted territory, the GP2 was all new to everyone. Sorting it meant riding it as much as possible. 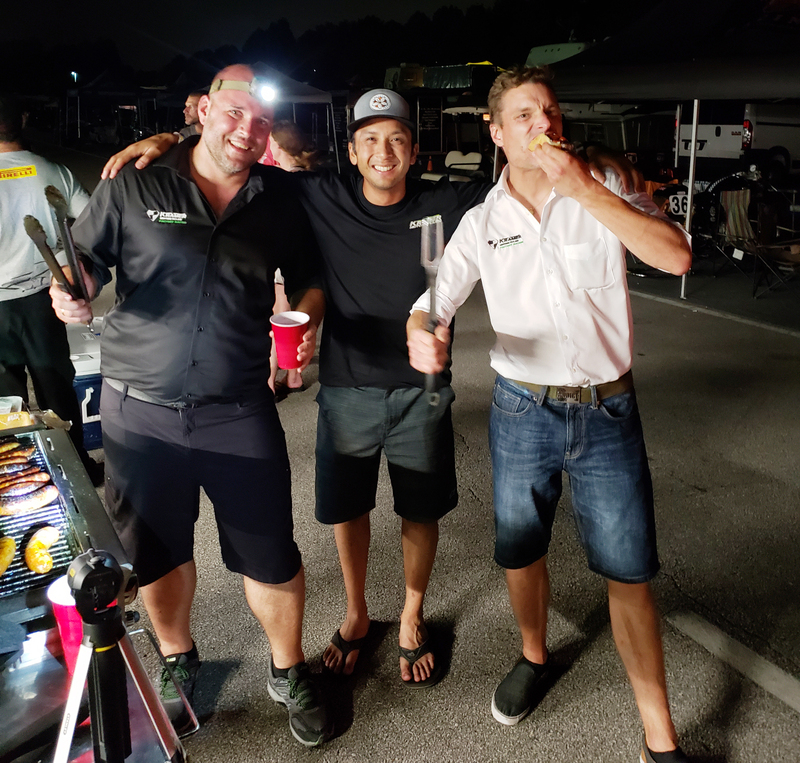 Even Markus Kramer himself made the trek from Germany to Alabama, along with right-hand-man Matthias Bock, to see his newest baby take its maiden voyage. If he had done his math right, there wouldn’t be much for him to do. Luckily, Markus also knows his way around a toolbox in case the math was wrong. Markus Kramer (left) and Matthias Bock – two great guys to have in your pit. In case you’re wondering, yes, Markus does grill up a mean bratwurst. 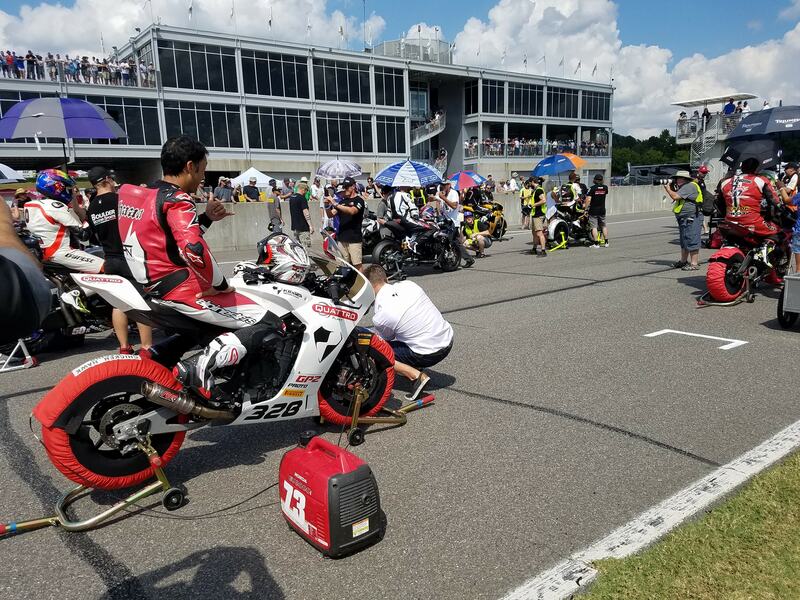 For the Barber Vintage Fest, AHRMA (the American Historic Racing Motorcycle Association) earmarks Thursday and Friday entirely to practice, with Saturday and Sunday being race days. Needless to say, we’d need to take advantage of both practice days, with the high probability of using the races as additional testing time, too. To that end we entered the GP2 in five races, one of which was the Pro Challenge, with the winner taking home $8,000 of a total $18,000 purse. 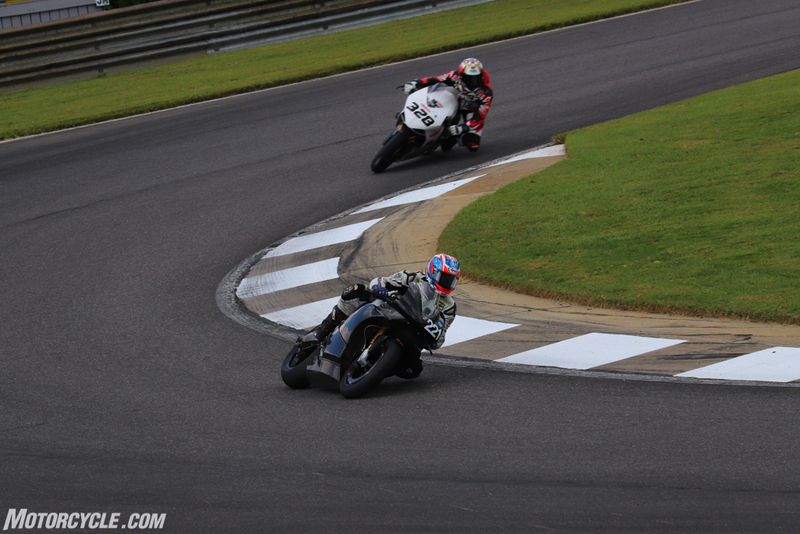 With actual money on the line, the fastest riders on the fastest bikes would be battling it out for glory. Names on the entry list included MotoAmerica and World Superbike competitor Geoff May aboard his EBR superbike, former MotoAmerica Superbike rider – turned Dunlop test rider – Taylor Knapp aboard a Ducati 1199 Panigale, and British Superbike star Tommy Bridewell aboard a custom Pierobon chassis powered by a Ducati 1299 engine. At the tail end of the list was my name, on a motorcycle with half the power as the top guys – and even less talent to boot. No pressure, but there was definitely no backing out now. Things got off to a bad start as I didn’t even complete my first lap before I had to bring it back. The suspension settings were entirely too stiff for my liking, and by the time Karvonen and crew adjusted the clickers and changed the preload, there were only a few minutes left in the session. Nonetheless, bringing the GP2 across the line for the first lap in practice brought cheers of joy from the team. From there we were constantly chasing suspension issues, as no matter what we did the bike always felt too stiff – I was bouncing over bumps instead of having them get absorbed by the suspension. Being slightly heavier than the single-cylinder EVO2, Markus figured heavier springs were needed on both ends. It took less than a lap to figure out this wasn’t the case. Unfortunately, it took much longer to find the lighter springs we needed. It was a minor miracle we were able to find lighter weight springs for both the fork and shock from our own parts bin and the parts bin of other riders in the paddock, and doing so changed the attitude of the bike completely, providing more confidence to carry more corner speed and allowing me to feel more comfortable getting on the gas earlier. Our best guess had the GP2 making about 100 horses to the wheel, putting us well down on the rest of our competition. However, with the GP2 hovering around 300lbs, we were hoping our weight advantage would work in our favor. It did, but anywhere a bigger bike could stretch its legs the GP2 was left behind. Miraculously, there wasn’t much else to complain about with the bike. It scrubs speed like nobody’s business, changes direction with ease, and is still plenty quick while still on its side – something I would soon learn to take advantage of, as the GP2’s downfall was its lack of straight-line speed compared to the other machines it was up against. Opening the gas early and often is mandatory on the GP2, and I was happy to oblige to hear the 790 Twin roar. Come the big Pro Race on Saturday we were still sorting out little issues, trying to fine-tune setups with the limited time we had. Nonetheless, it was time to head to grid for all the marbles. Sitting on the grid, it was clear our little GP2 was down on power compared to the Ducatis, EBRs, BMWs, and even a Triumph 675 Daytona. 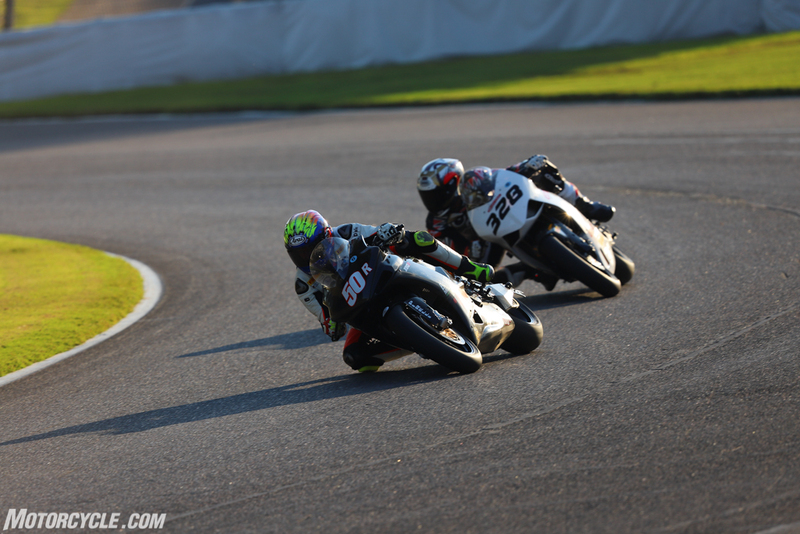 Starting from seventh on the grid out of 11, a decent start meant I wouldn’t be last by the end of the first lap. Surprisingly, thanks to the Kramer’s agility, I held on to my seventh place position for most of the race. However, once the trio of May, Knapp, and Bridewell flashed by me and put me a lap down my concentration lapsed, allowing Tom Wilbert on another Ducati-powered Pierobon to put me down a position. 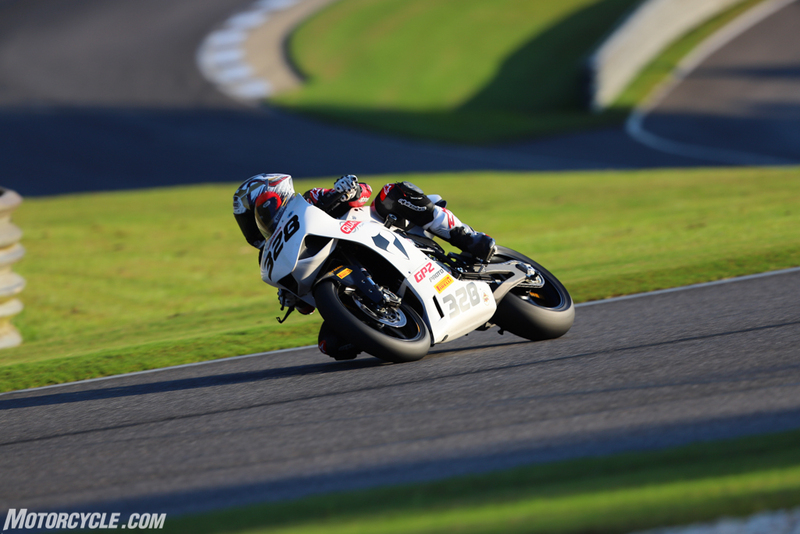 Long-time AMA competitor Walt Sipp, aboard his Buell, put down similar lap times to the GP2, but the two of us achieved our times in very different ways. He on power, I on agility. While the result wasn’t amazing, I was inspired by the fact the GP2 could hang with the big boys, but there was still more time to be found, as I saw other machines getting better drive on corner exits than I could. Enter Oscar Solis of Pirelli, who suggested I try the SC0 compound – the softest available – of the Diablo Slick in a 180/60-17 instead of the 180/55-17 SC2 I had been using. His reasoning was two-fold: First, Solis explained Pirelli’s latest developments have been put into the SC0, whereas the SC2 haven’t seen much change. Second, the taller profile would put a bigger footprint on the tarmac at full lean. Combine that with the added grip and I should get better drive. It made sense to me, so we slapped the tire on. With no practice time on Sunday, the first I’d get to try the new tire would be in my first race of the day, Sound of Thunder 2, with various machines like Triumph Daytona 675s, BMW Rnine Ts, and EBR 1190 RXs, among others. Wouldn’t you know it, Oscar was right! Within the first three laps of trying the new tire, it was a clear step better. Not only did it feel like I could lean the GP2 over further, but also I could carry more speed leaned over, and sure enough, I felt more comfortable opening the gas earlier on exits. An unintended benefit was the slight change in gearing, which proved really helpful through the sweeping corners of the track, as I could hold a gear a little longer before hitting the limiter. The timesheets also didn’t lie – we dropped nearly a second off the times, ultimately finishing fifth in a field of 38. Coming in hot! Unbeknownst to me at this moment, Taylor Knapp (44) and Geoff May (99) aboard their Ducati and EBR superbikes, respectively, are about to put me a lap down. BSB star Tommy Bridewell is just out of shot. Despite having more than twice the horsepower – and a lot more talent – my times aboard the Kramer GP2 were only nine seconds slower. By our last race of the day, Formula Thunder (again, a class where the big boys on the big bikes come to shine), we had tweaked the bike as far as we could with the equipment we had, and though the tire change made a big difference, some more time to play with geometry and suspension could have brought us even further. Still, with nearly 30 motorcycles to contend with, I was starting to feel confident of our chances to do well. 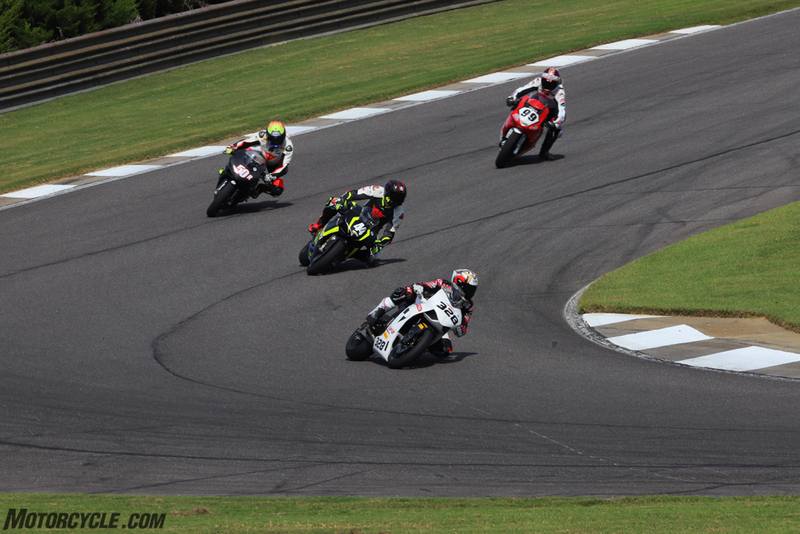 At the start, Tommy Bridewell – BSB frontrunner, don’t forget – took off and wasn’t seen again. This left Pierobon-mounted Tom Wilbert and I battling it out for the remaining spots on the podium. The entire time it was a seesaw affair; Wilbert easily distanced me with horsepower, and I would catch it all back in the corners, the GP2’s amazing agility – and its power deficit – was on full display. On the last lap, the only hope I had was a Hail Mary dive on the inside on the last corner, hoping the pass would distract Wilbert just enough for the Kramer to squeak to the line. Having lined him up for the entire lap, when the last series of corners came, the opening was there for the taking. After the dive, the only thing left was to stretch the imaginary throttle cables, but it was no use; Wilbert easily powered by me at the line. Third was the best I could hope for. Much of my weekend was spent studying the tail section of Tom Wilbert’s Pierobon. He was quicker in a straight line (noticing a trend here? 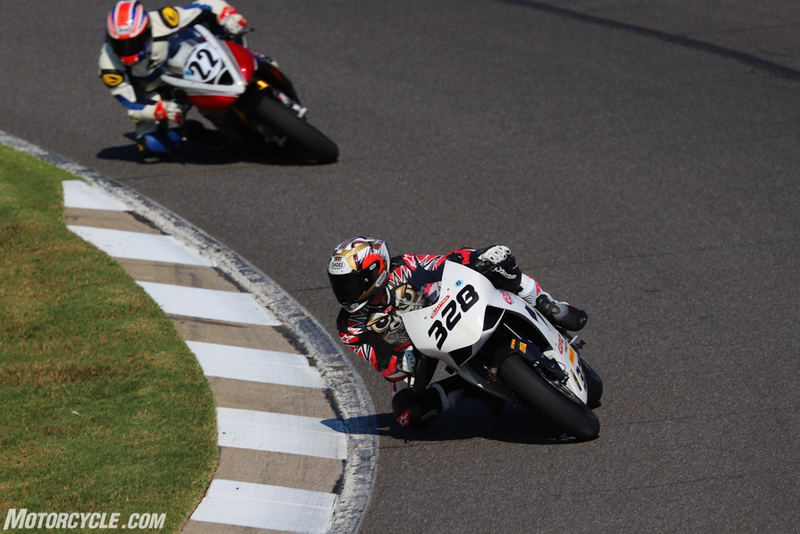 ), while the Kramer could get him through Barber’s sweeping back section. In our final race of the weekend, he would beat me to the line by less than 0.2-second to take the victory – so close! Or was it? Little did we know, but Bridewell decided to enter the pits to make changes to his bike, putting him several laps down and meaning Wilbert and I were fighting for the win! Ultimately it wasn’t meant to be, but the real key ingredient missing from the GP2 is power. Considering the 790 engine was as stock as they come – and the fact the motorcycle didn’t even exist four months prior – the whole team was nothing but happy with the GP2’s debut race weekend. It turned heads and came 0.160-second away from bringing home a first place trophy. The bike, like its rider, are almost ready for the big time. Being a prototype, it might be a little early to say what’s to come of the GP2. Looking at Kramer’s current model, the EVO2, it’s available in two variants: the “lower” spec S and the “no-expense-spared” R, so expect the GP2 to follow suit. Again, it’s too early to know pricing, but the beauty of Kramer Motorcycles is their relative affordability. 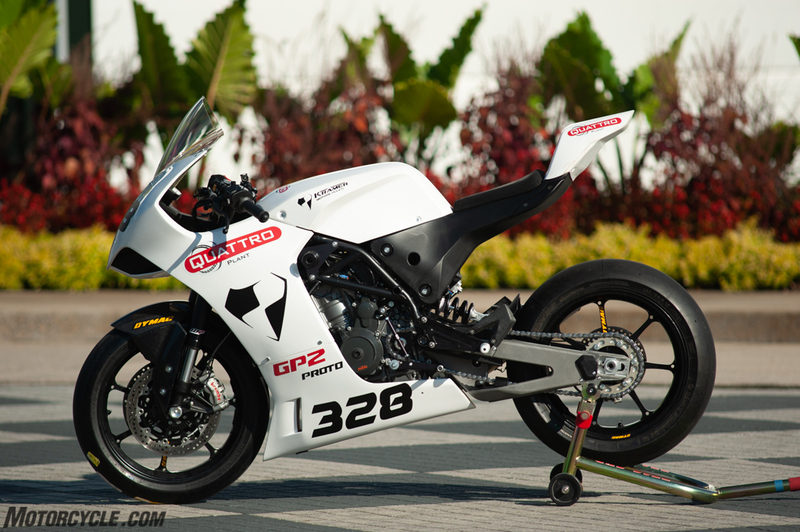 At $16,990 for the EVO2 S, you get a true “Ready To Race – and win” motorcycle. Try doing that with an R6. Rest assured, the GP2 is going to be a weapon. And if you don’t end up liking it, feel free to blame me.